If Donald Trump has taught us anything, it is that the past is not always prologue. The assumption is that the President’s party will lose a significant number of seats in the 2018 midterm elections. Over the past 21 midterm elections, the President’s party has lost an average 30 seats in the House, and an average 4 seats in the Senate. Don’t assume that will happen in 2018. The most recent polling data, as summarized by RealClearPolitics.com, suggests the Democrats are losing the momentum they possessed only a few months ago. 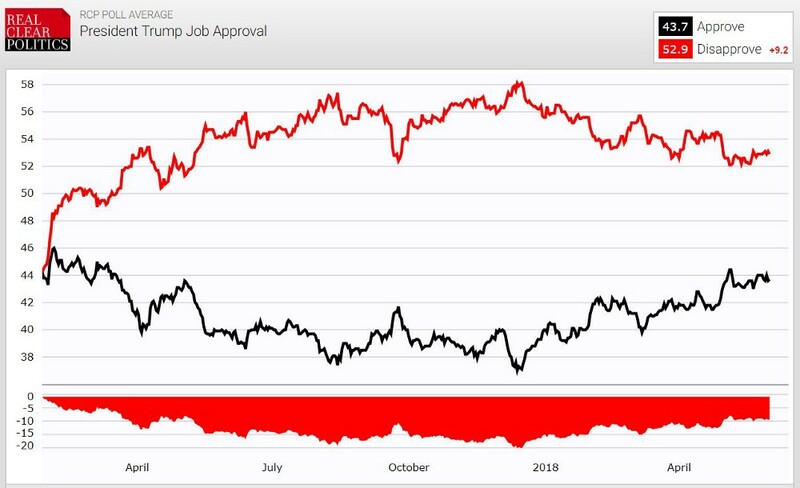 Donald Trump’s job approval numbers are also on the rise, and have been since December 2017. If the current trends continue, Trump could be looking at approval numbers around 48 percent around election time. 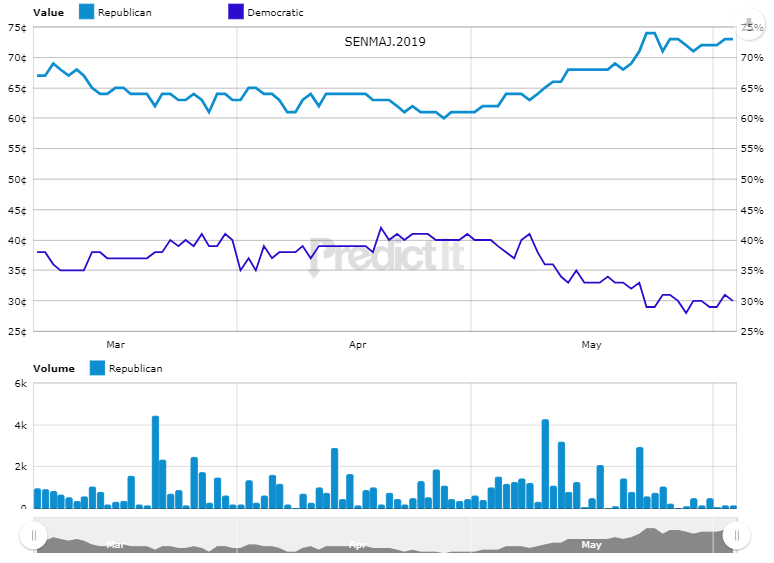 Nonetheless, even with gerrymandering and geographic clustering working to the Democrats’ disadvantage, the prediction market, PredictIt, is still giving the Democrats a roughly 60 percent chance of re-taking control of the U.S. House. 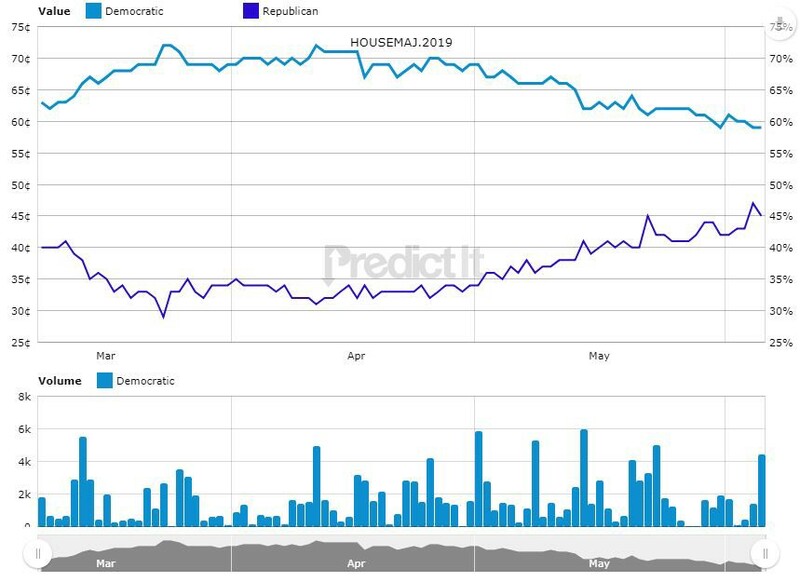 But that is significantly lower than a month ago when PredictIt was giving the Democrats a 70 percent chance. 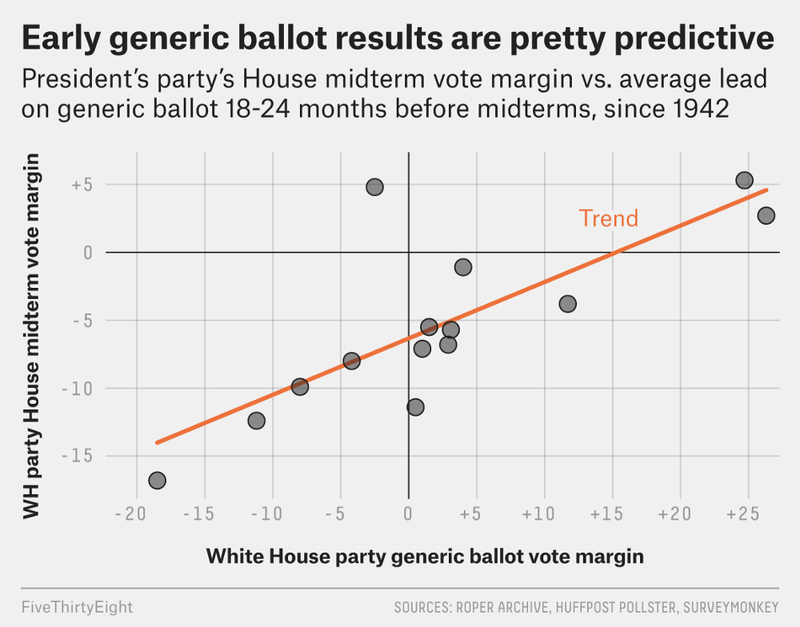 The trends are in the GOP’s favor right now and have been since the beginning of the year. Another bad sign for the Democrats is the number of “toss-up” races (based on polling) in the upcoming U.S. House elections. If we assume the “leaning” Democratic and Republican House districts end up going to the party currently favored, that gives the Democrats 195 seats and the Republicans 206 seats. That leaves 34 House contests considered “toss-ups,” according to RealClearPolitics.com. It takes 218 seats to form a House majority. In other words, the GOP just needs to win 12 of the 34 “toss-up” districts. And if these 34 districts are truly as even as the polling suggests, then we would expect the GOP to win 17 of these races— enough to keep their House majority. A year ago, it would have been hard to find a Republican that thought their party would be in this position six months out from the midterm elections. But the GOP is in that position. And why? More and more of the American public is giving Trump credit for the strong economy. “Nearly 2 in 3 Americans think the nation’s economy is in good shape, and most of them believe President’s Trump’s policies are at least somewhat responsible for that,” according a recent CBS News poll. American’s are behind President Trump heading into the Trump-Kim Jong Un summit later this month in Singapore. Three-quarters of Americans support the idea of a Trump-Kim summit, according to a CNN poll, and 53 percent approve of how Trump has been handling the North Korean situation. There may be a growing Trump-Russia collusion fatigue among Americans. Even Democrats recognize the possibility: “I think the American public will be tired of it (the Trump-Russia probe) if this is not wound down in this calendar year,” Senator Mark Warner (D-Virginia) said in May at Recode’s Code Conference, a California gathering of senior tech executives. If it were any other president, these positive factors would have the party in power talking about increasing their legislative majority in Congress. Donald Trump is not any other president. He employs a high-risk strategy of sowing division within the electorate (immigration, Spygate, NFL player protests, etc.) on the assumption this will motivate his base and enough independents to keep his governing coalition intact. We will see if that strategy works. These current polling numbers, whether it is the generic congressional ballot or for the individual House races, do not yet reflect the potentially higher quality of Democratic House challengers. Candidate quality remains one of the most important predictors of electoral success (see research on this topic here and here). “When national conditions are favorable for one party, quality candidates from that party will run, while those from the other party will wait for a more opportune time,” writes Xavier University political scientist Jonathan Simpson. As we head deeper into the summer, the quality of the Democrats’ House challengers will become more apparent in the polling numbers. 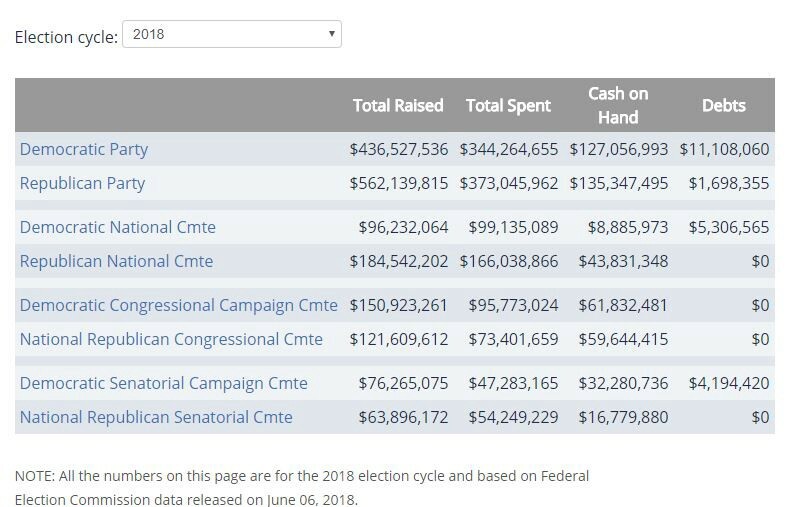 The Democratic Congressional Campaign Committee (DCCC) has raised $151 million for the 2018 election cycle compared to $122 million for the National Republican Congressional Committee (NRCC). While there is reason to be skeptical about the impact of money on congressional election outcomes (Please check out G. Elliott Morris’ work on this topic here), I think most politicians would rather have more money than less money when compared to their opponent. Furthermore, the decision to run for Congress was most likely made in late 2017, when Trump’s approval and the generic congressional ballot numbers were still in the Democrats’ favor. This generally means higher quality Democratic candidates were more likely to decide to run for Congress than in previous election cycles. 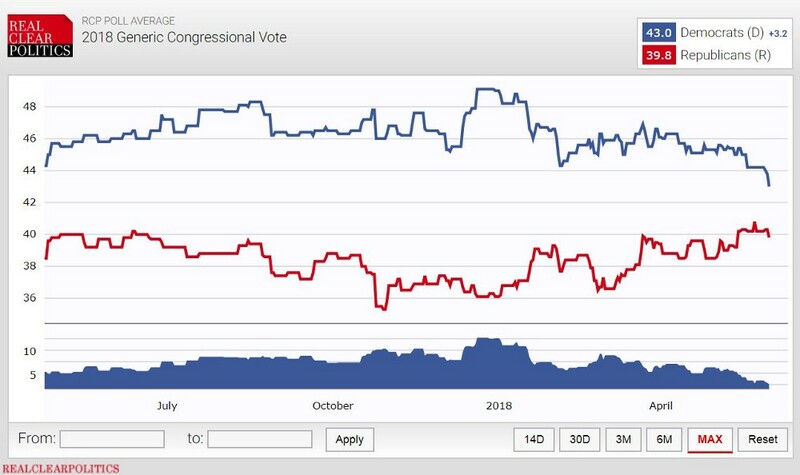 The improved approval numbers for Trump and the GOP since 2017 may not be helping the GOP’s prospects as much as they would have had they occurred earlier in 2017. Yes, the Republicans are looking better heading into the midterms. But is it too late for them to save their House majority? We are also seeing generally high turnout rates among Democrats for special elections and primaries, which bodes well for their prospects in November. Midterm election results are largely a function of partisan turnout differentials and 2018 is looking more and more like 2006 (when the Democrats gained 31 House seats). Still, a lot will happen between now and November. If we assume prediction markets, such as PredictIt.com, are like other financial markets, only new information (i.e., ‘shocks’ to the system) will alter the probabilities of the Democrats winning control of the House. While the probability of a recession between now and November is very low, it is not zero. According to economist Ted Kavadas, as of June 4th, the “Yield Curve Model” shows a 11.1 percent probability of a recession in the U.S. in the next 12 months. An unexpected recession would be deadly to the GOP’s prospects in November. We might be looking at a GOP loss of 60 or more seats in such a scenario. And even if the country doesn’t dip into a recession, a trade war between the U.S. and its major trading partners (Canada, China, Mexico, Europe etc.) is a real possibility. Would a trade war help or hurt the GOP’s prospects? In Iowa, at least, where Trump won the presidential vote by nine percent over Hillary Clinton, pork tariffs by Mexico and China could cost Iowa pork producers over $560 million a year. If that is allowed to continue, Trump and the GOP will suffer significant electoral losses in Iowa in November 2018. The Robert Mueller III-led investigation into whether the Trump campaign colluded with the Russians will produce more indictments over the next six months. If those indictments directly concern an actual conspiracy (i.e., collusion) between the Trump campaign and the Russians, this will not help the GOP’s chances in November; particularly, if future indictments are issued against anyone in Trump’s inner circle: Donald Trump, Jr., Jared Kushner, Roger Stone, or Trump himself. In the GOP’s favor, if Trump and Kim reach of tangible decision in Singapore regarding North Korea’s nuclear program, it is difficult to imagine this won’t help the GOP in the midterm elections. A failure to reach an agreement, on the other hand, may not work for or against the GOP. It is hard to know how a diplomatic failure would be perceived by the American voter, but I suspect it will depend on how the ‘failure’ is spun within the major media outlets. Also, in the GOP’s favor, is a strong economy that is looking more robust by the day. It is hard to imagine an American voting population that does not consider the strength of the U.S. economy when making their vote decisions for U.S. congressional candidates. The Democrats continue to talk down the U.S. economy, but the reality remains…the U.S. economy hasn’t been stronger since 2000. The GOP should be encouraged by recent trends. Trump is not the drag on the Republicans as he once was only a few months ago. Assuming no major mistakes on his part over the next six months (and that is a tough assumption to make), the Republican Party is poised to minimize the damage from the 2018 midterms. Will they keep control of the U.S. House? Probably not, but it will be closer than many Democrats think. And though the U.S. Senate hasn’t been discussed in this essay, the prospects of the Democrats gaining control of the Senate are diminishing by the day. Short of Mueller revealing tangible evidence that Donald Trump himself colluded with the Russians in the 2016 election, the U.S. Senate is a lost cause for the Democrats. All eyes therefore should be on the U.S. House where the Democrats, while not in as comfortable position as they were in late 2017, are still likely to take control of the House after the midterm elections.